Thank you for visiting Ultimate Kilimanjaro® - The #1 Guide Service on Mount Kilimanjaro. For over a decade, we have provided the highest quality service at a reasonable cost. Our expert guides, quality standards and focus on safety have made us the top choice for thousands of happy customers from all over the world. We are one of the largest and most reputable operators on Mount Kilimanjaro, leading over 150 climbs per year and guiding more than 1,000 people annually. Our clients have included celebrities, film makers, senators, ambassadors, authors and journalists. All agree, you won't find a better Kilimanjaro outfitter. Book your trip today for the Ultimate Kilimanjaro® experience! • "Very well planned & organized"
• "Excellent service all around"
Yes, you can! Every year, over 30,000 people just like you come to Tanzania to climb Kilimanjaro, the world's tallest free-standing mountain and Africa's highest peak. Download The Ultimate Kilimanjaro® Guide and see what it's like to climb Mount Kilimanjaro with us. Mount Kilimanjaro is a place of myth and folklore. Located 200 miles (325 km) from the equator, the mountain defies logic with its crown of ice. Climbing Kilimanjaro does not require any technical skills or special equipment, just some physical fitness and determination. People from all walks of life, from a 7 year old child to an 85 year old man, have successfully summited. But the challenge should not be taken lightly. You need to understand what lies ahead. Rest assured, you will find the answers to all your questions here - at Ultimate Kilimanjaro®. Ultimate Kilimanjaro® is an authoritative expert in the industry. We have been featured in best selling books, award winning documentaries, television shows, international magazines and newspapers. Our clients rave about us in reviews and testimonials, and they happily refer us to their friends and family. Thousands of people have stood on the summit of Mount Kilimanjaro with us. Won't you join us on the Roof of Africa? We invite you to explore our site for the most complete and accurate information on climbing Mount Kilimanjaro. 1. How do I choose an operator? 2. How much does it cost to climb? 4. Which route should I climb? 5. How many days are needed? 8. How do I train for the climb? 9. What about altitude sickness? 10. What safety measures are taken? 11. Do you care for your local staff? 12. Why are some company's prices so low? 13. Can I preacclimatize to altitude? 14. Do you offer safaris? Alexandra Tanbai penned Kilimanjaro Uncovered - An Alternative Path to Bliss in real time during her climb on the Northern Circuit Route with Ultimate Kilimanjaro®. The book provides valuable guidance for those interested in climbing themselves and tells a broader story of a truly life changing experience. PART I - Preparation: While Alex over-prepared her hike, she found a lack of concise, trustworthy information in other literature like how to select the best tour operator. Kilimanjaro Uncovered provides comprehensive, unbiased guidance how to organize an adventure based on in-depth research and analysis rather than rumors and assumptions. PART II – Hiking: Alex tells her story with honesty, self-deprecating humour, real passion and a zest for life. In easy-to-read conversational style she bares her heart with descriptions of what it means to feel vulnerable and how strength prevails when one feels most exposed. We are honored to be partnered with The Heroes Project, a non profit organization that supports climbing programs for wounded veterans by putting them on some of the highest summits around the world. The Heroes Project and Ultimate Kilimanjaro® led injured veteran Julian Torres to the top of Mount Kilimanjaro. GQ writer Davy Rothbart accompanied the team on the expedition and subsequently wrote a story of the climb entitled Mount Impossible: How a Disabled Veteran Conquered Kilimanjaro. The expedition, called Operation Kilimanjaro, put the team at the top of Kilimanjaro on Veteran's Day, November 11th. CNN interviewed Julian live from the summit of Mount Kilimanjaro. On March 2018, a group of adventurers summited Mount Kilimanjaro on the first all-vegan expedition to Africa's highest peak. The Vegan Kilimanjaro team, consisting of 17 people ranging from 18 years to 70 years old, were powered by delicious 100% plant-based meals prepared by our talented mountain chefs. To join this exciting expedition, please contact team advisor Mike Weinberg (mike.weinberg1952@gmail.com) for more information. The U.S. Representative from Arizona is a marathon runner and completed an Ironman Triathlon earlier in the year, which included a 2.4 mile swim, a 112-mile cycling ride and a 26.2 mile run. Now she adds climbing Mount Kilimanjaro to her list of achievements. Tim Ward, best selling author of What the Buddha Never Taught, Savage Breast and Arousing the Goddess, successfully climbed Mount Kilimanjaro with Ultimate Kilimanjaro®. His first hand account of his journey is available in his book,Zombies on Kilimanjaro, a humorous and thoughtful literary travel narrative. A father and son climb Mount Kilimanjaro. On the journey to the roof of Africa they traverse the treacherous terrain of fatherhood, divorce, dark secrets and old grudges, and forge an authentic adult relationship. The high-altitude trek takes them through some of the weirdest landscapes on the planet, and the final all-night climb to the frozen summit tests their endurance. On the way to the top father and son explore how our stories about ourselves can imprison us in the past, and the importance of letting go. The mountain too has a story to tell, a story about climate change and the future of humankind - a future etched all too clearly on Kilimanjaro’s retreating glaciers. Ultimate Kilimanjaro® participated in the making of Tanzania: A Journey Within. 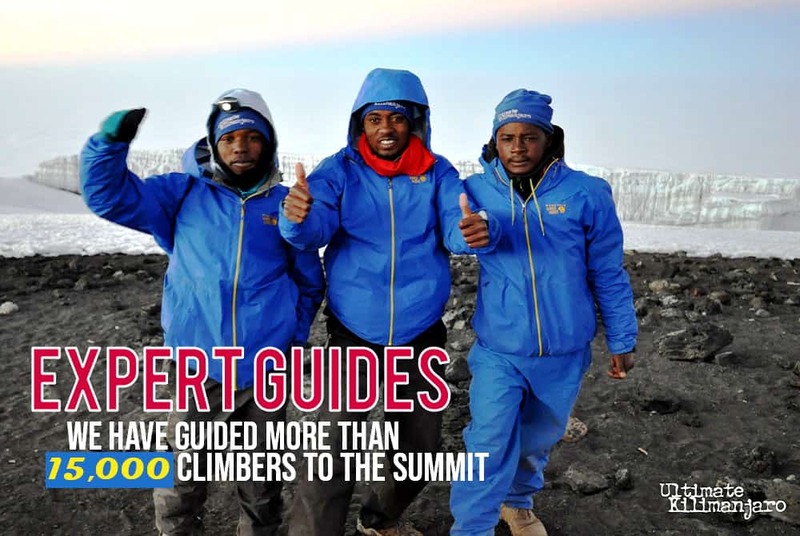 Ultimate Kilimanjaro® successfully guided the film's subjects to the top of Kilimanjaro. The film has won many awards and was released in commercial theaters in 2014. Celebrity filmmaker Sean Davies produced a six part documentary series called Adventures to the Edge. One episode features his climb on Mount Kilimanjaro with Ultimate Kilimanjaro®, and discusses the changes to the environment on and around the mountain. Other participants on this climb included Hong Kong celebrity models. The team successfully summited, while raising money and awareness about man-made climate change.